Once again Google has updated their platform version chart, and this time OS Version 2.1 has something to celebrate. 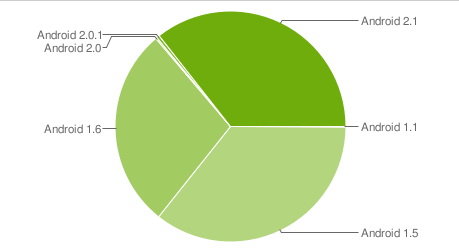 If you haven’t been keeping track, Google has a chart that illustrates the breakdown of Android versions on devices currently in the wild. This is done primarily so developers will know what version to develop for, but has also been used as ammunition for Android’s detractors who like to bring up fragmentation as one of Android’s biggest flaws. Until April, the chart would go several months with out any new updates, but since the fragmentation argument started gaining ground, Google has switched to a more consistent update schedule, posting new results every few weeks. While previous figures had Android 1.5 and 1.6 sharing the lead, the most recent numbers show 2.1 gaining significant ground, and for the first time ever it claimed a larger percentage than either 1.5 or 1.6. It will be interesting to see what, if any, tricks Froyo will have up its sleeve. Google has previously stated that one of Froyo’s primary goals would be to help stem fragmentation and bring all devices up to speed. With the amount of time it took many of the device manufacturers and carriers to push the 2.1 update out, I’m curious to see how they’re planning to accomplish this. While Google may partially be at fault for the fragmentation woes, it’s clear that the real slow downs are occurring with the carriers and device manufacturers. When companies like HTC and Sony skin Android so heavily that it requires deep hooks in the operating system’s framework, that means additional time will have to be spent porting their skin to a new version of Android, which subsequently delays the carrier’s evaluation of the software, and ultimately, when the updates will reach the customers. We should know what, if any, remaining surprises Google has in store when they announce Froyo this week at the Google I/O conference. I wouldn’t be surprised if they addressed the issue of fragmentation in greater detail as well.